In recent years, the energy market in the U.S. and globally is expanding the production of renewable energy. Solar energy for electricity is also expanding in the U.S. Indiana is one of the states expanding solar energy with solar photovoltaic (PV) systems. Therefore, we conduct benefit cost analysis with several uncertain input variables to determine the economics of adopting solar PV systems in Indiana based in policy instruments that could increase adoption of solar PV systems. The specific objectives are analyses of the cost distribution of solar PV systems compared with grid electricity in homes and estimating the probability that solar can be cheaper than electricity from grids under different policy combinations. We first do the analysis under current policy and then the analysis under potential policy options for a variety of scenarios. Also, the results inform government policymakers on how effective the alternative policies for encouraging solar PV systems are. The results show that current policies are important in reducing the cost of solar PV systems. However, with current policies, there is only a 50-50 chance of solar being cheaper than electricity from grids. 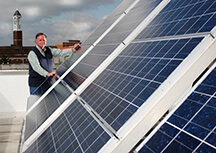 If potential policies are implemented, solar PV systems can be more economical than grid electricity.